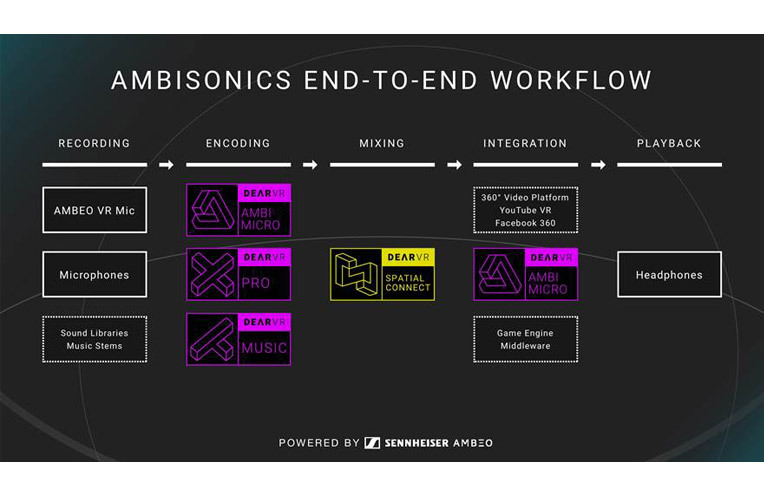 With 3D immersive audio continuing to make its way into productions globally, Sennheiser and its partner Dear Reality are showcasing a full scene-based end-to-end workflow for VR and 360° video productions at NAMM. Recording solutions on display include the Sennheiser AMBEO VR Mic for Ambisonics recordings, the AMBEO Smart Headset for easy binaural content production, and Neumann’s much revered KU 100 binaural head. Meanwhile, Dear Reality will demonstrate its dearVR SPATIAL CONNECT mixing software, which enables engineers and creators to mix spatial audio for 360° videos in a VR environment. In addition, Dear Reality announces its upcoming dearVR AMBI MICRO VST/AAX plug-in for DAWs, developed in cooperation with Sennheiser’s AMBEO team. 3D audio production techniques will also be featured in the [email protected] program by Sennheiser’s 3D audio engineer, Gio Jacuzzi. His presentation, “Dynamic and Static Binaural Recording, Mixing and Reproduction for Immersive Audio”, will cover the entire toolchain for recording, mixing, and playback of binaural content, and can be seen at the Hilton, Level 4, C7 on Friday, January 25 from 4:00 p.m. to 6:00 p.m.